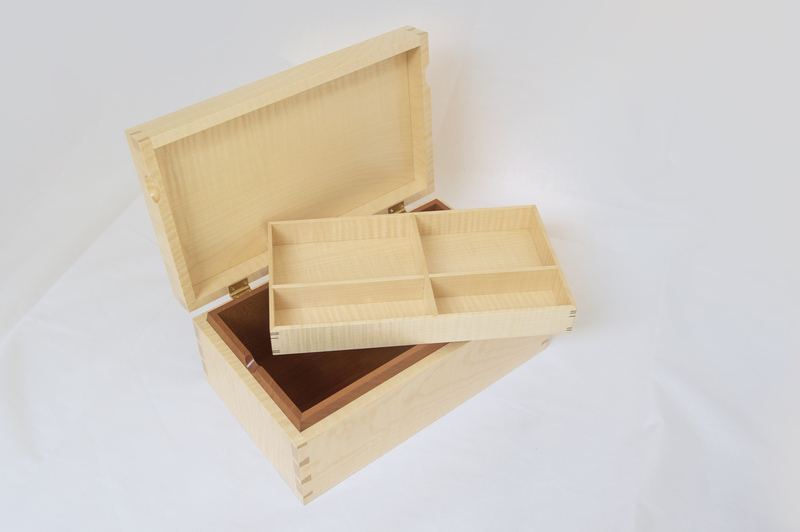 Jewellery boxes should be echoes of the quality of the products they contain, and it’s the small details that subconsciously add up to give the total effect of visual titillation as the eye dances across the French polish, the clean dovetails, the snug brass hinges. And then there are the invisible details too, such as the piston-fit of the tray that allows it to lower soundlessly on a cushion of air, and the chamfer on the liners that softens the lid’s fall. The box is made from ripple sycamore which, as the name suggests, has a grain that gives a holographic texture. The bottom and liners are made from air-dried English pear wood which is exquisite to work with, coming off the plane blade like chocolate. The finish is shellac and wax on all interior surfaces, and a full French polish on all exterior surfaces.